His newest version of PG8X is just excellent. Really, really impressed with this FREE softsynth. The new version is coded in c++ instead of the old synthedit one. 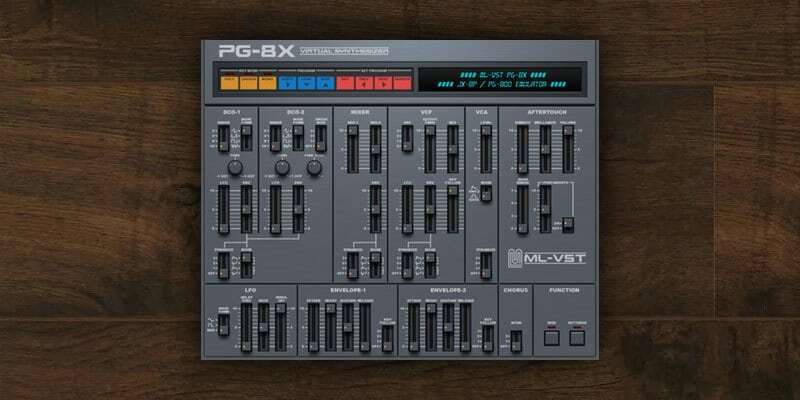 And it has got a new, beautiful interface, looking like a cross between the PG-800 programmer and the JX-8P. Just look.. I owned a JX-8P for some years, and I really loved the JX sound. However the keys were sticky and build quality felt not so good anymore, so I sold it. But before that I made my own patchbank, of which I made an audio demo of all the patches. Now you can load JX-8P sysex files in PG8X, so I loaded in my own bank and A/B them to my old real JX demo. I am stunned with the results. The sounds are spot on, exactly the same as in my demo. I also loaded in the factory presets and they are just as faithful. As far as I am concerned, I have my JX-8P back again. I was just playing this tonight, wishing I had saved my patches when I had a JX8P. It really does sound great. A bit of a CPU hog on my aging iMac, but a great sound nonetheless. One issue I did have was trying to open the .fxb files from the site. I couldn't get PG8X or Ableton to recognize them as an available file. Anyone else have this issue? It is really nice - the Roland synths have a quite unique character I find quite attractive. I'm waiting for the AU version to be brought up to scratch before using it properly. I have always been impressed with PG8X, and it just keeps getting better. Being a former JX8P owner, I also stand by its authenticity as being outstanding, up until you get into the really high resonance, where it just sounds more harsh and more stable than a real one. No aisling in the oscillators, good cpu usage(only seems to be more for crossmod sounds), and a nice smooth tone. I can always get lost in the original Soundtrack preset, and it's just as fantastic here, if not better. Bass is also stunningly good! Silverfish wrote: One issue I did have was trying to open the .fxb files from the site. I couldn't get PG8X or Ableton to recognize them as an available file. Be sure to separately download the presets in the newer formats from the dropbox page where the latest beta is stored. Load them from within the plugin itself. The older fxb/fxp files no longer work. Donate to Martin if you can, this is quality work! Minihost and VSThost keeps telling me it's not a valid VST plugin. How do I import midi sysex files? VSTHost worked fine for me. To import JX-8P sysex you must click "LOAD" on the VST interface and find your .syx file. Thought there was a kind of sysex import or something like that. When I try to load it in VSThost nothing happens when I doubleclick the .dll .. Doesn't load your old presets (would be difficult, they'd be tapes or WAVs, not sysex). I really love having all the old synths in the computer. Total control, instant recall, much less organising to do, and you can use more than one at a time straight away, instead of multi-tracking. Here is a little demo I made with PG8X using some of my own patches I made with my JX-8P, a few Roland factory presets and 909 for drums. And I just had to try the "Beverly Hills Cop" theme. I think the JX8P comes very close, I love the JX bass.. It's Nice Post . and find the exact Martin Lueders PG8X . This is indeed a great plugin, especially for free. My hardware is starting to collect dust these days because now I have half a dozen plugins that sound near identical to the real thing, it's just so much more sreamlined. I really like the new look of the interface on this one as well. I still can't get it to run on Freehost or VSThost. I don't own any big budget sequencers. Maybe the .dll file itself is corrupted.. Very nice. I dialed in a good sound within 30 seconds added a preset patch and was banging out some 80's in under a minute. Sounds great.